1 Place sushi rice in a sieve and rinse with cold water until the water runs clear. Drain in a sieve for about 20 minutes. Place rice and 250 ml (approximately 1 cup) water in a pot and bring to boil. 2 Cook uncovered for 2 minutes, then cover and cook until rice is tender and liquid is almost completely absorbed, about 20 minutes. Remove the pot from the heat, remove lid and cover with a kitchen towel. Let stand for 10 minutes. 3 In a small pot, bring the rice vinegar, 1/2 tablespoon mirin, the sugar and 1 teaspoon salt to a simmer, stirring until the sugar and salt have dissolved. Place the rice in a bowl and fluff with a fork to let it cool faster. Pour the vinegar mixture over the rice and allow to cool completely, about 30 minutes. 4 Rinse salmon fillet, pat dry and cut into 2 cm (approximately 3/4-inch) cubes. Lightly season with salt. 5 Fill a small pan with 2-3 cm (3/4 to 1 inch) water. Add 1 tablespoon soy sauce and the remaining mirin and bring to a boil. Add salmon, cover and simmer until cooked through, 5-6 minutes. 6 Remove salmon with a skimmer, drain well and place on a plate to cool. 7 Squeeze juice from the lime half. Mix together 1 tablespoon lime juice with the cheese, Worcestershire sauce and a few dashes of Tabasco in a bowl. Season with salt and pepper. 8 Cut or flake the salmon into pieces and mix into the cheese mixture with a wooden spoon until well combined. 9 Cut nori sheets into 12 strips, each about 3 cm (approximately 1 inch) wide. 10 With moistened fingers, form the cooled rice mixture into 12 small oval shapes. 11 Wrap each rice oval with a nori strip, smooth side out. Stick 2-3 rice grains on end of strip to help it adhere. 12 Place the "boats" on a plate. Spoon the salmon mixture into each boat. Garnish with caviar. 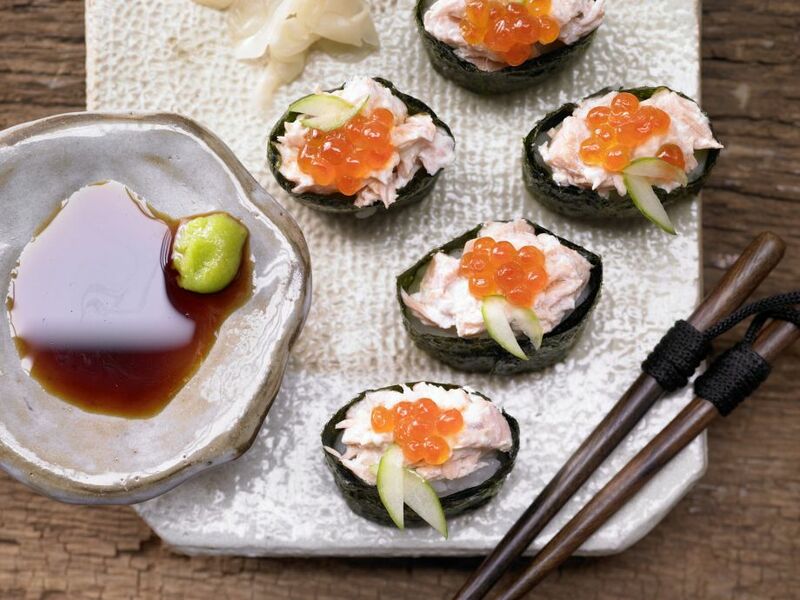 Serve with pickled ginger, wasabi paste and soy sauce.